I planned to have a quiet afternoon in front of the fire last Sunday to escape the heavy November rain, but an afternoon of doing nothing more than turning the pages of a good book didn’t materialise. The rain stopped at lunchtime so I decided to take the boat up to our wharf and vacuum some rainwater out of the bilge. Rain trickles through the hinged steel plate above the weed hatch where it collects in a channel and then, in theory, drains through a hole and into a hose where it is directed through the side of the boat and into the canal. Unfortunately the drain hole has quite a small diameter so it often gets blocked from dirt falling into the channel from the deck above which means that rainwater overflows the channel into the engine bay. It’s a bit of a nuisance because rain flows from the roof onto the back deck too so there’s plenty of water cascading down on to the back deck and then into the engine bay after overflowing the blocked channel. In theory, the trip should have taken me no more than an hour and a half; fifteen minutes for each of the two locks on the way up, another half an hour for the locks on the way down, and half an hour for a quick blitz with our man sized wharf wet vac. Of course, as soon as I entered “canal time”, the minutes stretched into hours. I arrived back on my mooring just as the light was fading after removing every drop of water from the engine bay, freeing up the hinge on the flap over the weed hatch, and tidying up the engine room. All in all, it was a very enjoyable afternoon spent pottering. Sunday afternoon was far more pleasant than most of my working week. I felled and logged a dozen ash on Monday, which I enjoyed, then spent the rest of the week pressure washing the walkways, which I didn’t enjoy nearly so much. Seven hours a day of trying to remove a high pressure hose from the gaps between the wooden boards nearly drove me mad. Just to make matters worse, I discovered that my waterproof leather rigger boots are far from waterproof. I’m sure the synthetic fur lining will dry out eventually. On Tuesday I received an email from Waterways World announcing that tickets were available for the Crick show next year. For a moment, as in previous years, I was poised to delete the email instinctively thinking of all the time restricting reasons I couldn’t go or couldn’t stay for very long. Then I remembered, there’s nothing stopping me from staying as long as I want next year! I’ve ordered a three day pass and an online mooring in zone one close to the show. I actually think I’ve overdone it. I’ll probably have seen all I want to see in half a day and, as I like peace and quiet on the boat, a zone one mooring is possibly the worst place for me to moor, but time will tell. On Friday I was reminded yet again that I need to get my new headlight fixed. After yet another thoroughly enjoyable discovery day cruising through rural Warwickshire I inched my way back into the marina in total darkness. I was very fortunate to have 6’3″ tall Richard Baven with me who helped navigation no end by holding my five million candle power tunnel torch above his head pointed in the general direction of my mooring. I managed to get where I needed without crashing the boat or falling in, so it was a pretty good day all round. I spent another very pleasant day out on the cut again today. The weather was perfect; a light and not too chilly wind, patches of brilliant sunshine but a grey and overcast sky when we headed west back to Calcutt Boats in what can often be very difficult cruising conditions if the sun is low on the horizon and shining brightly. We returned today with just enough light to see what we were doing. Estelle, my copilot for the day, left the boat tired but happy that she’s going to be a confident and competent single lady boater in the very near future. I published an article in last week’s newsletter about the pros and cons (mainly cons) of cruising in London. 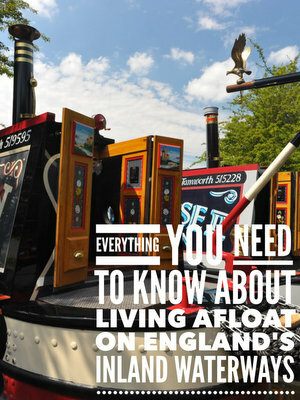 I invited comments from newsletter readers in general and newsletter readers who live on boats in London in particular. Sadly I didn’t hear from any London boaters, but here are a few comments from those who have visited the capital by canal. “Reading the piece on London’s “Continuous cruisers” I was reminded of a couple I met recently on the painting course I attended. They were a lovely couple and I liked them very much, however I did not like the way in which they used / misused the waterways. Peter and Jane (Not their real names) were attending the painting course to acquire the skills to repaint their existing narrow boat which at 45 feet was a bit small for them as they live aboard. They were planning on starting a family and released that if they were to continue to live aboard then they needed something bigger. They both work in Central London and commute from the boat each day. I asked them where they moored and how much a residential morning cost. The answer from Jane surprised me “oh no, we don’t have a mooring, we are continuous cruisers” I asked her how this worked she replied “ We are on the Regent canal at he moment, we always stay within or close to zone 1 and 2 for the tube. If we have any hassle from CRT we move to the next tube station. When we move we text our mates and we all, that is several of us, all move at the same time, keeping somebody on the tow path to hold the spot. We have been doing this for about two years. I asked if they thought that this was within the rules and Peter responded “ Everybody does it, it is the only way we can afford to live in London as the rents are so high. If we could find a flat then obviously that would be better, but we simply will never be able to afford one”. This couple had hired a car to drive from London to Northampton, stayed for two nights in an hotel and paid several hundred pounds to attend the course. I would suggest subsidised by those of us who pay for a CRT license and have a paid for mooring or stick to the rules for continuous cruising. As an amusing aside Peter and Jane had brought their toilet caskets with them to empty at the yard where the course was being held, amazing the lengths people will go to. I imagine that Peter and Jane are paid extra for working in Central London, for a start they will get London Weighting allowance (£4000 each per annum) How much is an official mooring? When potential boat owners visit me for a discovery day, while we are having coffee and before we venture out onto the cut for the helmsmanship aspect of the day, I walk them through my boat showing them various features, layouts and items of equipment on board. I discuss the pros and cons of each item or area and what, if anything, I could do to improve the situation on my own boat given the wisdom of hindsight and with the benefit of living on board for nearly five years, working at a boatyard and handling and getting to know the more than two hundred and fifty boats we have moored here at any one time. I’ve been told that the exercise is very useful indeed. I thought that you might find a virtual walk through of my boat useful too if you are considering buying your own in the near future, of if you have recently purchased a boat and are still at the stage of thinking of ways to try and improve it. My boat isn’t perfect by any means but the layout and equipment on board works for me. Even if you don’t like what I’ve got, maybe this virtual tour will give you a few ideas. Have you watched the video and read the article? You have? Good. Now everything will make sense. My boat, full name James No 194, built ib 1977 at Norton Canes, is 62′ long with 48′ of internal cabin space. I have a “traditional” stern narrowboat which means that the cabin comes nearly all of the way to the back of the boat giving more internal living and storage space but less space at the back of the boat for people to stand while cruising. The boat has a far larger than normal diesel tank. The Mercedes OM636 engine uses 1.24 litres per hour so, in theory, I could cruise for 282 hours or forty days at seven hours a day without refueling the three hundred and fifty litre tank. I cook using gas only, heat the boat using just a solid fuel stove burning coal briquettes and heat my water either via the boat’s engine when it’s running or via an immersion heater if I’m plugged into the national grid. My on board electrics consist of four 135ah batteries in the leisure bank and a dedicated 110ah battery to start the engine. The batteries are kept topped up via a charger when I’m plugged in to the national grid and by three 100w solar panels with an MPPT controller and the engine’s single alternator when I’m not. My toilet is a Porta Potti Elegance with a twenty one litre waste tank. I don’t have a pump out toilet. That’s the overview, now let’s start the tour at the front of the boat. If you’ve watched my narrowboat storage video, you’ll be able to relate to what follows. You’re not on the boat with me, so I won’t make you a coffee. You’ll have to make your own, which is a shame because I have a wonderful Nespresso coffee machine. At the very front of the boat is the bow locker. It’s where my propane gas is kept which is used both for cooking and to power my suitcase generator. I have four propane cylinders in the locker; two 13kg for cooking and two 6kg for the generator. I was using one 13kg propane cylinder every twenty one days when I had a gas on demand water heater. With that removed and the propane used for cooking only, the same size cylinder is lasting four times as long. The bow gas locker is a bit of a pain when changing empty cylinders for full ones. Thirteen kilos is the weight of the propane inside. The cylinder probably weighs the same again, so the two together weigh about the same as a bag of coal. The easiest way of getting the full cylinder down into the locker is by carefully lifting it on to the bow to avoid scratching the paint with the often rough metal of the cylinder bottom, holding it steady with one hand while you leap cat-like onto the bow, then lowering it slowly through the hatch. Of course, you need to remove the empty cylinder first. You have to be very careful you don’t slip if the bow is wet or icy. Cruiser stern narrowboats often have the gas lockers on the rear deck where they are much easier to access. Behind the bow is the front deck. Like most narrowboats, mine has a well deck as apposed to a low flat tug style front deck. My front deck has a cratch board, a triangular wooden frame standing vertically between the bow and the front deck, which supports the cratch cover which encloses the front deck. The cratch cover converts a space which is rarely used in the winter into very useful and dry additional storage space. Inside the boat there are cupboards and shelves either side of the front doors, then about four feet from the front bulkhead on the starboard side is my old and very faithful Torglow stove. The same stove has been in the boat since it was built in 1977. The flue has been replaced a couple of times and the glass in the stove door has been changed regularly. It’s a reliable and dependable heat source which I wouldn’t want to be without, but it’s not perfect. I would change the for a Morso Squirrel in an instant if I could. My stove has quite a small footprint so there’s no room on top to place pans for food cooking or warming. The space isn’t even big enough to hold an Ecofan to help push the stove’s heat towards the back of the boat. Not that the Ecofan would work on my stove anyway. It has a double skin on the top plate so even with a fire raging within, I can place my hand quite comfortably on the top. The Ecofan needs the heat from the fan to make it work. Unfortunately, I can’t switch to a Squirrel because of its size. It is three inches deeper than my Torglow so the new stove would stick out three inches further into the centre of the boat and be three inches closer to the upholstered seating opposite. The only way I could fit a new Squirrel in the boat would be to change the stove position to the front of the boat which would necessitate removing the front bulkhead cupboards on the starboard side. However, the new position would then be classed as a new installation and subject to the new BSS regulations. This would increase the price by several thousand pounds. Opposite the stove is bench seating in an “L” shape. I have sat on more comfortable seats before but the big advantage is the storage space they offer underneath. We have an anchor and chain, vacuum cleaner, summer folding camp chairs and a box for files under the seats, all hidden neatly away. Aft of the lounge seating area is the dining area. It’s a Pullmans dinette which is bench seating either side of a fixed table. The dinette is a great place to sit and eat while engaging in the old fashioned pastime of conversation rather sitting with a meal on your lap vegetating in front of a television. It’s also a wonderful location to spend an hour or two on a wet and windy Sunday afternoon with a newspaper spread in front of you. The dinette, like the bench seating near the stove, has storage space underneath. Behind the dinette is the galley. Ours is small, but still big enough to cook a Sunday dinner if we choose. There’s a four ring Vanette hob, grill and oven. All run on gas. There’s also a 98 litre fridge. Ours, like most narrowboats, is twelve volt and because it’s twelve volt, it’s horribly expensive. In an electrical superstore a similar sized 240v fridge would cost about £150. Our fridge cost just under £500 but it’s worth every penny. The problem with a 240v fridge is powering it when you are off grid. The fridge would need to be powered via the boat’s inverter. It’s not something that I would want to do for two reasons; firstly the inverter itself uses power so you would be increasing the drain on your battery bank for an appliance which, for most boat owners, would be on twenty four hours a day, seven days a week. The second reason is noise. Most inverters are in or near the engine room. Many engine rooms are next to the main sleeping area. Our inverter is in the engine room fixed to the pine cladding just three feet away from our heads when we are laying in bed. We often have the inverter on just before we go to sleep while we are laying in bed reading. The noise is very annoying and drowns out the natural sounds from outside which we enjoy so much. Having the inverter droning away all night long while we are trying to sleep would drive us mad. Next to the galley is our “utility room”. This is a three feet wide section between two sapele bulkheads which is home to our washing machine and where there is a side and a roof hatch on both the port and the starboard side. Two very popular narrowboat washing machines are the Candy and Zanussi compacts. They are good machines but use a fair amount of power. We have this twin tub washing machine . It’s cheap and cheerful but does the job very well indeed. We can fit everything we want to wash on the boat into the machine. What we like most about it though is that it uses about a tenth of the power that the more popular machines use. The wash cycle uses 120w and the spin cycle 180w. The twin tub comes with hoses to attach to the mains supply but we haven’t risked it as the hoses look as substantial as drinking straws. Next to the washing machine area, much too close as far as I’m concerned, is my “office”. It’s a second bedroom which contains two full size bunks and a compact bunk for a small child. This area also has two five drawer chests built in. I’ve kept the two bunks just in case we ever make any friends and they want to stay the night, but I use the base for the smaller bunk as a dedicated office desk. On the desk are my laptop and printer/scanner/copier and my beloved Nespresso coffee machine. The machine makes wonderful cappuccino and latte coffees but isn’t very practical when we’re off grid. It needs 1800w. Unfortunately the boat’s inverter can handle just 1600w. I’ve had to buy a suitcase generator to power it when we ‘re cruising! I spend many hours each day on t’internet researching or adding content to this site so a reliable internet connection is very important to me. I’ve been using mobile broadband dongles by Three for about four years now. The earlier dongles needed to be outside of the boat in order to pick up a half decent signal so I had a long USB extension lead plugged into my laptop then then out through one of the boat’s roof vent’s to a mast on the roof. These days the dongles are much more powerful. I now have their latest MiFi dongle. I have it stuck on my office window with Velcro pads where it nearly always picks up a strong enough signal for me to send and receive emails and usually a strong enough signal to stream video from BBC iPlayer, YouTube or similar. Next is the boat’s bijou walk through bathroom. It’s just four feet long and 5’10” wide (the internal boat width). One one side is the shower, on the other the sink and toilet. We have a cassette toilet. It’s a Porta Potti Elegance. The two main types of toilet on narrowboats are cassette and pump out. Pump out toilets look like conventional toilets. They store the waste in a coffin size tank beneath the toilet. The waste tank often extends out of the bathroom into the bedroom and under the bed. A cassette toilet sometimes has a conventional looking toilet but sometimes, like ours, looks like a square plastic box with a toilet bowl in the top. The waste is stored in a removable tank under the toilet. Ours hold 21 litres so when it’s full it weighs about the same as a 25kg sack of coal. Our cassette needs emptying every three or four days if we’re in the marina or every two or three days if we are cruising and using it more often. The advantages of a cassette toiletare that it’s free to empty at Elsan points and it can be taken off the boat to empty even if the boat is frozen in during a particularly cold spell. The disadvantages are the relatively small waste tank and the need to lug the unwieldy sloshing tank out of the boat twice a week and the need to get that much closer to the previous night’s dinner when you unscrew the cap and empty the tank contents down the Elsan point’s open sewer. Many, maybe most, owners of pump out toilets also carry a cassette toilet on board for emergencies. Personally, I don’t see the point but I may revise my opinion next year when I’m cruising for extended periods and need find Elsan points as and when I need them. The bathroom now has a wonderful shower. It’s a joy to wash my dirty little body now that the gas powered instant water heater has been removed. Getting the shower water temperature right was a nightmare. If the water was too hot and I turned the control know a millimetre the temperature would plummet to near freezing. I would turn the knob in the opposite direction and and need to move pretty quickly to avoid jets of scalding steam. Having a shower wasn’t a pleasant experience. Now all that has changed. I had the gas heater removed and a 55l horizontal calorifier fitted under our double bed. The water in the calorifier can be heated in three different ways; when we are connected to the national grid via our shore line, a 1kw immersion heater does the job. If we are away from the marina, the engine heats the water, but the engine needs to be run at either end of the day to provide a constant hot supply. That’s no problem though because I just split the battery charging regime into two different sessions. The calorifier has a twin coil so I can also heat water using the boat’s diesel central heating system, or I will be able to once the central heating system is installed IF I can ever find a heating engineer who is interested in doing the work! The penultimate area of the boat is our bedroom. It’s just big enough to house our 6’3″ long, four feet wide double bed, a wardrobe at the bottom of it and a corridor down the side. Sally and I are both fairly short and slim so the size suits us. Having said that, even at just 5’10” tall, I have to sleep on the corridor side of the bed so my feet can hang over the end of the bed to give me a little more space. We could create a wider bed by having an infill piece made to drop into the corridor space but then we would need somewhere to keep the additional bed part when we weren’t cruising. We’re happy with what we have, especially as there are six spacious drawers under the corridor side of the bed. Last, but far from least, is the heart of the boat, the engine room. Because we have a traditional stern narrowboat, the engine is enclosed within the cabin space rather than underneath an open deck as it is with cruiser stern narrowboats. The advantage of having the engine in the cabin is that the space above the enclosed engine can be used for storage. I have a comprehensive selection of tools stored here. I’m not entirely sure what most of them do, and I’m sure they would be of more use if I took them out of the original packaging, but they’re there if I ever need them. I have the bulkhead between the engine room fitted with a selection of hooks and brackets to store my mooring pins, chains, lump hammers, spare ropes and a set of jump leads which are very handy for starting the engine if the starter battery goes down and there’s still a charge in the domestic bank. On another wall I have shelving to hold a wide range of paints and brushes for touching up the boat, spare grease for the greaser, a high power tunnel torch, recovery magnet and reel of paracord, engine oil, three in one oil, WD40, varnish and I’m sure one or two other items I’ve forgotten. The shelf unit sits next to the charger which allows me to keep the batteries topped up when I’m connected to the shore supply, an MPPT controller for the three 100w solar panels on the boat roof and my Sterling 1600w pure sine inverter. Beneath this equipment is my battery bank of one 110ah starter battery and four 135ah leisure batteries. On the starboard cabin side are a couple of coat racks for hanging waterproofs, hats, gloves, waterproof map case, binoculars, camera and, on occasion, my chain saw. Of course, the most important item in the engine room is the engine itself. I’m very happy with my 38HP Mercedes OM626. In the thirty seven years since it was installed in 1977 it’s clocked up a very modest 4,526 hours, nearly 10% of which have been added in the last twelve months. I’m not worried about the increased use in the last year though. I’ve been told by a couple of engineers who know these engines that it should be good for 100,000 hours which means that no matter how much cruising I do, the engine is going to outlast me. There’s one feature of the engine that I would probably change if I could. It’s raw water cooled which means that water is drawn directly from the canal to help cool the engine. Most engines these days are keel cooled. To stop it drawing engine clogging debris into the machinery, there’s a fine mesh grill in the side of the boat and then a mud box to catch the finer stuff. I haven’t had a problem with either the mesh or the mud box being blocked yet but I’m sure the time will come. I have to take the mud box apart periodically and clean the accumulated much out. It’s a painful process as the mud box sits in the bilge near on the port side near the bulkhead between the engine room and the bedroom. The mud box is very difficult to reach because of the steel frame which was welded around the engine a couple of years ago to support the deck boards which now cover it. A couple of months ago I had the engine cover renewed, improved and insulated. The work has made an enormous difference to my cruising. Before the engine insulation was fitted I could hear very little else other than the engine when I was at the helm. I had to endure shouted conversations with anyone standing on the back of the boat with me. I also found communicating with passing boaters or anyone on the towpath virtually impossible. I’m sure in the past that I’ve nodded and smiled in complete agreement with other boaters who were telling me what an idiot I was. Now I can hold a normal spoken conversation when I’m travelling. I’m a very happy bunny. My boat is far from perfect and probably wouldn’t suit a lot of boat owners. However, it’s a very different boat than the one I moved on to in April 2010. It’s warm, dry and looks pretty good. It’s going to allow me to live in comfort and cruise long distances with total confidence in the months and years to come. There’s nothing about the boat now that I would either change or improve. Not much anyway. I feel very lucky to own this boat and I can’t wait to unleash it on the unsuspecting waterways network next spring. “Firstly, I must apologise for taking so long to get back to you with this feedback after doing the Discovery Day with you, but unfortunately I have been extremely busy since I arrived back off shore and don’t seem to have had five minutes to myself. Secondly, I would like to thank you for fitting me in at such short notice, and the coffee, gloves, etc. that you supplied. Greatly appreciated! The day itself, being a little windy, and rainy (I’m so glad your checklist of items to bring with me included wet weather gear), gave me a real insight (as a complete novice) into what living and travelling on a narrowboat is about. Exactly what I was wanting. I feel that if it had been a calm and sunny day, although also highly enjoyable, I would not have learned anywhere near as much as I did. My initial apprehension at being let loose with your home soon disappeared, thanks to your clear and easily understood instruction, and, by the end of the day, I was feeling a growing confidence in my ability to handle James. There was a lot of patiently presented information to take in about bridges, locks, lines around bends, cross and tail winds, etc., but I think that I managed to take most, if not all of it, on board. All the information, tips, and advice you gave me about solar panels, solid fuel stoves, cooking aboard, layout, etc., etc., was extremely useful, and has been stored away for future reference for when I come to purchase my own boat, hopefully saving me a lot of unnecessary mistakes and expense. It was a pleasure to meet Sally, and I loved the feeling of tranquility that I experienced whilst we were heading back in the rain, with just the rhythmic sounds of the engine and the water lapping against the hull, watching the countryside passing slowly by, whilst the smell of Sally’s cooking wafting up from below. Davie was unusual in that he had driven down from Inverness to learn more about life afloat, but with a view to buying and living on a boat close to where he works in Scotland. The majority of attendees intend to explore the English and Welsh canal network.